Many species of wasp burrow in the ground -- at least 1,400 known ones, to be more precise. Luckily for you, they can all be grouped into three genera and it's easy to tell these apart from one another. In addition to these three groups, there are two families of bees that are sometimes mistaken for ground-burrowing wasps. Yellow jackets are hornets -- small, stout, aggressive wasps -- of genus Vespula who nest in holes in the ground. They aren't true burrowers. Rather, the queens find holes that are already there, then hatch workers to build paper nests inside the holes, but you probably aren't going to identify them by watching their construction habits. You can tell yellow jackets apart from other types of ground-nesting wasps by their numbers and reaction to you. Yellow jacket nests contain dozens to thousands of individual wasps, all eager to sting you in nest defense. Cicada-killer wasps are in genus Sphecius. There are more than 20 species of these hefty fellows and they have global distribution, including North America. While their 2 inches in length may look surprisingly enormous, they're only fearsome if you happen to be a cicada. Sphecid wasps are solitary and their sting is only used by females to paralyze prey, which they stash in their nests to feed their young. Females almost never sting in self-defense; males don't at all. Genus Sphex contains at least 130 species of digger wasps, cicada-killers' close relatives. They can be nearly as long as their hefty cousins, but they're usually much thinner. They feed their young numerous garden pests in their underground nests, especially beetle grubs, grasshoppers and crickets. Some of the mighty grasshopper-hunting species track their prey over long distances, earning them the common name "tracking wasps." Sphex wasps are also solitary, with stingless males and nonaggressive females. These beneficial agricultural insects are considered harmless to humans. Family Andrenidae is the mining bees. Family Anthropodidae is the digger bees. Both are sometimes mistaken for yellow jackets, but they could hardly be more different. 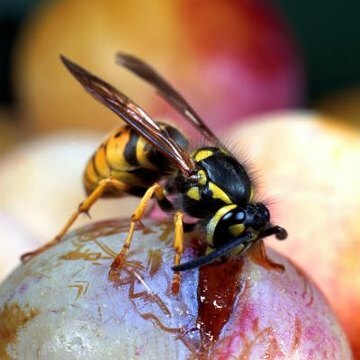 Their diet sets them apart from wasps -- they feed their young nectar and pollen rather than paralyzed prey -- but their behavior is otherwise similar to solitary digging wasps'. Females excavate nest burrows in the ground and rarely sting or are stingless. Males are all stingless. Burrowing bees are smaller than common honeybees and are often brightly colored or patterned similarly to yellow jackets. Adults only live a few weeks. These beneficial pollinators pose no risk to human beings.